I remembered last night's dream! I dreamed that I was with my best friend Sherwil at a village club that had a pond and a pool. In one corner of the pond area, there were buckets filled with koi. One particular fish jumped out of the bucket. Sherwil picked it up and showed it to me as it lay still, breathing, in her hand. "Look," she said, "I have had to learn how to do this." I shuddered, imagining shiny scaly slippery flesh squirming in my hand. Sherwil threw the koi back into the bucket -- and it leapt out again, landing with a thump. They kept at it several times, then Sherwil left. The rest of the fish started jumping out of the buckets. There was a puddle nearby, so most of them landed in splashes of muddy water. I ran around the buckets, forcing myself to pick up fish and put them back in the buckets -- only to find them jumping out again. They were calm about it too, as if they had decided to end their lives. They didn't thrash about on semi-dry land; they just lay there, gills drawing air, waiting to dry out. I thought that maybe they hated living in the buckets, so I decided to transfer them to the pond. One by one, I threw them in the pond and watched them swim away. But then the pond fish started leaping out of the water and staying on the rocks. I saw koi and shubunkin and even one tilapia. I ran around the pond, tossing them back in. I saw a silvery, long fish that had already dried up, but I still splashed it with water in a feeble attempt at reviving it. Its carcass stared back at me with one eye completely white. 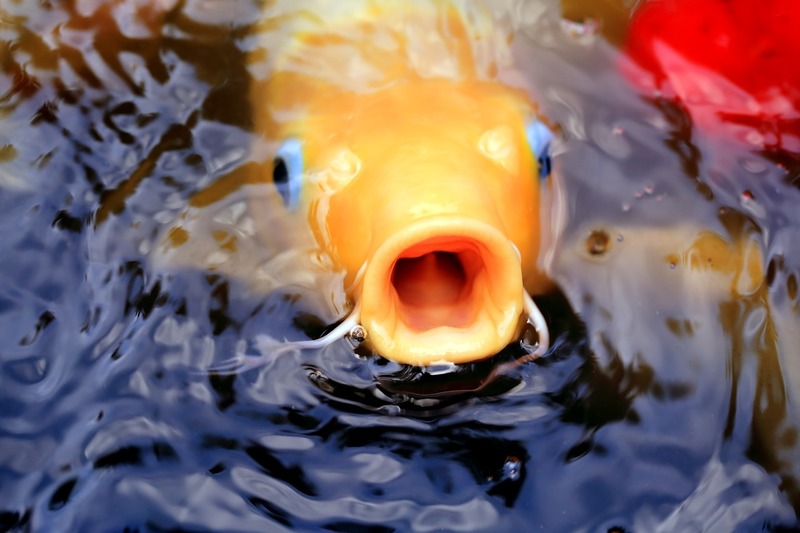 When I was done with the pond fish, I saw the glints of golden orange around the swimming pool: baby koi, no bigger than my finger, leaping out of the water, beaching themselves, calmly waiting to dry.